When you parents (or grandparents) were growing up, they probably didn’t purchase chicken broth from the store. Oh no. They made chicken broth from scratch, careful not to waste a single ingredient. This mentality stemmed from a time when food (particularly meat) was more scarce, so people tried to use every part of the animal. While ordering Kettle & Fire bone broth can certainly save you time in the kitchen, there’s nothing more satisfying than homemade chicken broth. It’s actually easier to make than you’d expect, and it makes your home smell incredible. If you’ve never made chicken broth on your own, don’t worry. Below, you’ll learn everything there is to know. Are Chicken Broth and Chicken Bone Broth the Same Thing? Technically, no. And there’s plenty of confusion between the two (including the fact that bone broth is actually more similar to chicken stock than chicken broth). Chicken bone broth and chicken broth are made with similar ingredients, using fresh herbs, apple cider vinegar, water, and animal bones. Chicken broth typically has some meat left on the bones, commonly made from an entire chicken carcass. Bone broth and chicken stock are usually made from animal bones with little meat, such as chicken feet. There’s another notable difference between broth and bone broth: the cooking time. 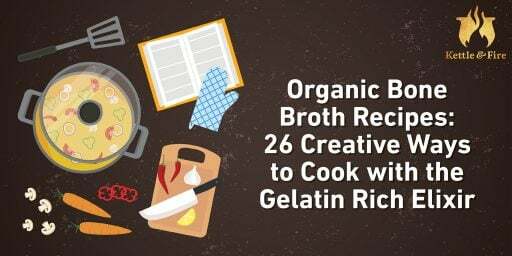 Bone broth can take up to 24 hours to simmer, releasing gelatin from the animal bones. Regular broth, on the other hand, can be made in as little as four hours. To make chicken broth, you’ll need meaty bones, vegetables, filtered water, apple cider vinegar (or other acid), and seasoning. In the recipe below, you’ll use a chicken carcass. If you roast a whole chicken, simply save the bones (no need to clean them!) to make your broth. Vegetables and herbs can be swapped in and out, depending on your tastes and preferences. The recipe below uses a combination of carrots, celery, onions, and bell peppers for vegetables; then parsley, fresh peppercorns, garlic cloves, rosemary, thyme, and a bay leaf for seasoning. The purpose of these ingredients is simply to add flavor. A quality broth starts with quality ingredients. Try to use pastured chicken (cage-free or free-range are good alternatives) and organic vegetables if at all possible. So…I Just Leave My Stove Top on All Afternoon? You certainly can, if you’re comfortable with that. How Long Does Chicken Broth Keep? Your homemade chicken broth should keep up to six days in the fridge. You can drink broth straight from a mug, or use it in soups, stews, curry, or to braise meat. If you have any extra broth, freeze it in an ice cube tray. Then, you can simply use 1–3 cubes later down the road, depending on what your recipe calls for. Pro tip: Silicone muffin pans also work great for this, allowing you to pop out a few cubes of broth with ease. While it’s time intensive, making chicken broth is actually relatively easy. The hardest part is collecting the ingredients. I can’t tell you how many quality bones I wasted throughout the years. I simply tossed them in the trash, when I should have frozen them for later use. 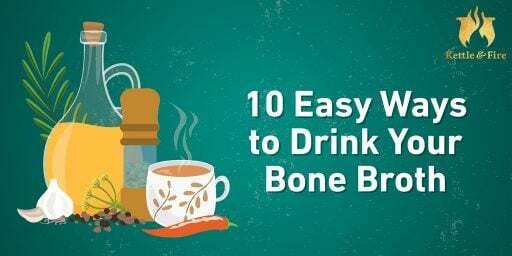 Save the bones from every meal you prepare: Even if you don’t have the bandwidth to make broth right in that moment, you should save all the bones from various recipes. Simply store in a freezer bag, then use when the time’s right. This will prevent you from going to the butcher to purchase additional bones. Freeze leftover vegetables: When you’re chopping onions, carrots, celery stalks, or other vegetables, simply save any scraps in the freezer. Strain, then strain again: After your broth has simmered for several hours, the meat will loosen from the bones, causing them to filter straight through a colander. To ensure there’s no meaty bits floating around your broth, use a fine-mesh large sieve or cheesecloth to strain your broth. Broth is associated with soups and stews, but there are countless recipe ideas to get more broth in your diet. If you see stock or bone broth as an ingredient (no matter if it’s pork, chicken, or beef broth) you can swap in chicken broth instead. Carnitas: To make carnitas, you typically place pork shoulder in a slow cooker or Dutch oven with a little broth, water, and seasoning for several hours. A similar process is used to make these pulled pork tacos. Chicken Pot Pie: Have you ever thought to make chicken pot pie with chicken broth rather than chicken soup? You can also use it in shepherd’s pie, beef pot pie, and other savory pies. Smoothies: While smoothies are packed with healthy fruit and vegetables, the common complaint is they’re too high in sugar and carbohydrates. 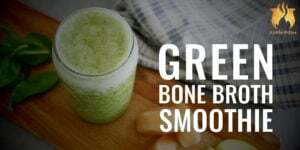 To create a more balanced smoothie, use broth instead of water, as with these recipes. Poutine: Chicken broth can easily be used to make gravy, which can be paired with mashed potatoes, stews, and meatloaf. Or, you can indulge and prepare a healthy poutine, as with this recipe. Creamy Risotto: Craving Italian tonight? This Creamy Mushroom Chicken Risotto uses chicken broth as its base. 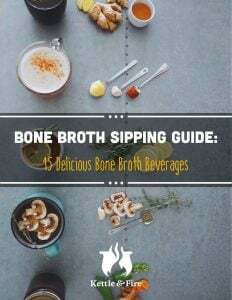 This is a Kettle & Fire tested and true slow cooker chicken bone broth recipe that features organic chicken bones, fresh vegetables, and herbs.